Description: A young family is among the new arrivals at the Tharsis Colony, set near the slopes of Pavonis Mons. Like all Martian settlements, it’s an “iceberg” city with ninety percent of the settlement underground. 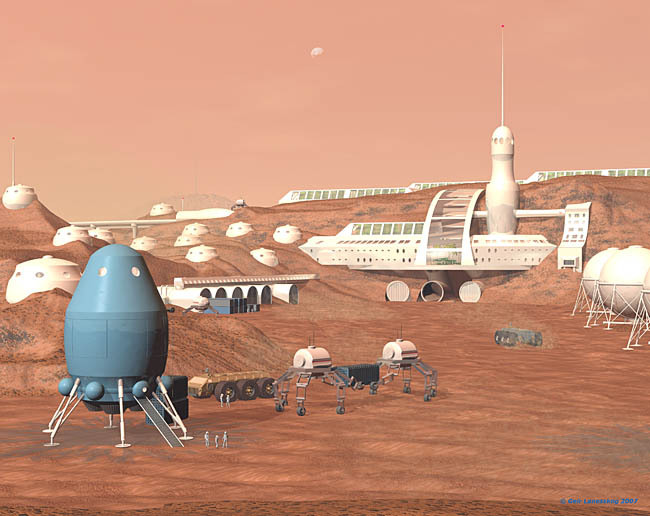 A monorail link connects the settlement to the Pavonis Beanstalk Project, an ambitious plan to built an orbital tower from the rim of the equatorial volcano. Medium/Tools Used: This image was modeled and rendered in Bryce 6.1 with some touch-up in Paint Shop Pro X2.